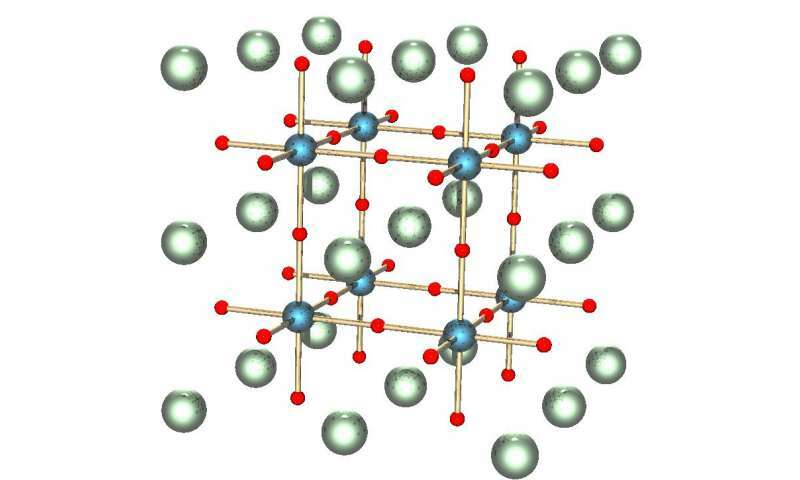 Perovskite lattice. Credit: Wikimedia Commons. Perovskites are a family of crystals that show promising properties for applications in nanotechnology. However, a property called carrier multiplication, an effect that makes materials much more efficient in converting light into electricity, has not been observed in perovskites. New research, led by UvA-IoP physicists Dr. Chris de Weerd and Dr. Leyre Gomez from the group of Prof. Tom Gregorkiewicz, now reports that certain perovskites do have this desirable property. Crystals are configurations of atoms, molecules or ions ordered in a structure that repeats itself in all directions. Examples include ordinary salt, diamonds and snowflakes. Certain crystals show very interesting properties at the nanoscale. There, we enter the world of nanocrystals, structures that are extremely useful in constructing technological applications at tiny scales. Perovskites, named after the 19th century Russian mineralogist Lev Perovski, form a particular family of materials that all share the same crystal structure. These perovskites have many desirable electronic properties, making them useful for constructing LEDs, TV screens, solar cells and lasers. For this reason, perovskites have been studied extensively by physicists in recent years. When semiconductors – in solar cells, for example – convert the energy of light into electricity, this usually occurs one particle at a time. A single infalling photon results in a single excited electron (and the corresponding 'hole' where the electron used to be) that can carry an electrical current. However, in certain materials, if the infalling light is energetic enough, further electron-hole pairs can be excited as a result; this process is known as carrier multiplication. When carrier multiplication occurs, the conversion from light into electricity can become much more efficient. For example, in ordinary solar cells, there is a theoretical limit (the so-called Shockley-Queisser limit) on the amount of energy that can be converted—at most, a little over 33 percent of the solar power gets turned into electrical power. In semiconductor nanocrystals under the carrier multiplication effect, however, a maximum efficiency of up to 44 percent is predicted. Thus, researchers have sought the carrier multiplication effect in perovskites. Now, de Weerd, Gomez and Gregorkiewicz, along with their collaborators, report this phenomenon. Using spectroscopy methods, the researchers showed that perovskite nanocrystals made out of cesium, lead and iodine display carrier multiplication. Moreover, they argue that the efficiency of this effect is higher than reported thus far for any other material; with this finding, the extraordinary properties of perovskites receive a new boost. De Weerd, who successfully defended her Ph.D. thesis based on this and other research last week, says, "Until now, carrier multiplication had not been reported for perovskites. That we have now found it is of great fundamental impact on this upcoming material. For example, this shows that perovskite nanocrystals can be used to construct very efficient photodetectors, and in the future perhaps solar cells."